Perfect Place to Snack and Relax Exterior Exterior Fully equipped kitchen with extra seating at breakfast counter. Indoor dining with amazing views! Dining area opens to fully equipped kitchen. Exterior King Size bedroom with side terrace. Built in work space in king size bedroom. Private Bathroom Beautifully Renovated Guest Bathroom Relax and Enjoy the Island Views A Hilltop View from Above Our Hilltop Resort Nearby Locations Spend your anniversary or honeymoon with us! Watersports Activities Our Activities Coordinators will help plan your excursions. When you book directly through Point Pleasant Resort (TM), rest assured that you are getting the best of. Since 2014, the resort has achieved the best reviews of any St. Thomas accommodations. Only by booking through the resort will you exclusively receive the seamless resort experience provided by our team of resort employees rather than a single property owner. Services include front desk, security, activity desk, bell staff, housekeeping, maintenance, phone operators, and on-site 24-hour management. No one knows the islands like our friendly, local staff; they have the best information on activities, entertainment, restaurants, and transportation. The resort offers free parking, WIFI, snorkel gear, beach towels, and daily rum punch! While you can pick the specific villa you want, rest assured that should something unforeseen go wrong in your villa, we can relocate you to another resort-managed villa so your vacation doesn’t miss a beat. And with us you will not be charged for housekeeping (often a savings of more than $100) if you stay 4 nights or more. The resort and beaches are as beautiful as ever! We strongly encourage you to book directly with the resort to enjoy the full range of services only we provide. This newly renovated villa offers a blend of modern detail complementing the original structure of Point Pleasant Resort - TM. The details include gorgeous updated cabinets; fixtures, appliances, and counter tops featuring painted original mahogany ceilings. 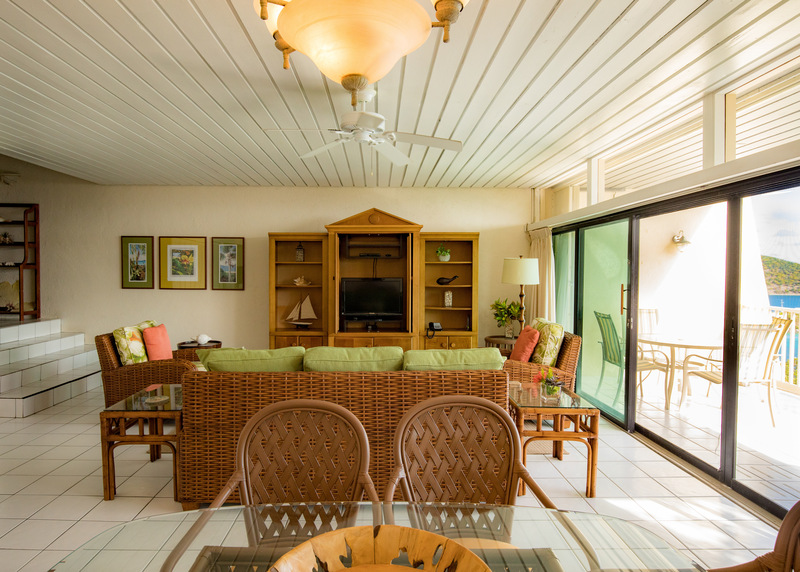 Enjoy down island views from the balcony offering dining for four and two additional chairs for relaxing outdoors. The living area is the perfect place to rejuvenate with a sofa that pulls out to a sleeper and two side chairs. Gather here and enjoy the views from indoors. 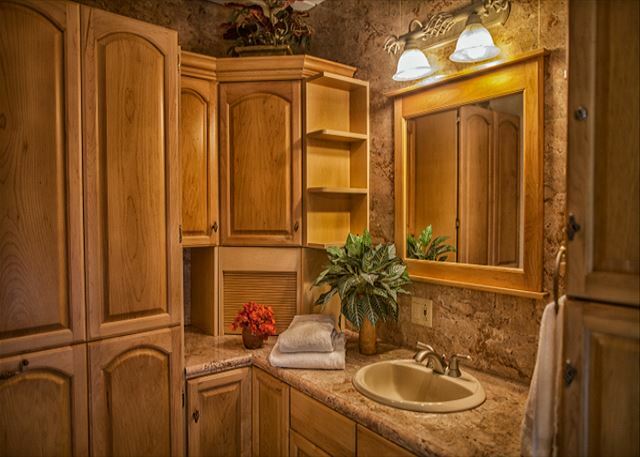 The king size bedroom has a private bathroom with tub/shower combination and a beautiful vanity completed with new cabinetry allowing space for all the necessities. 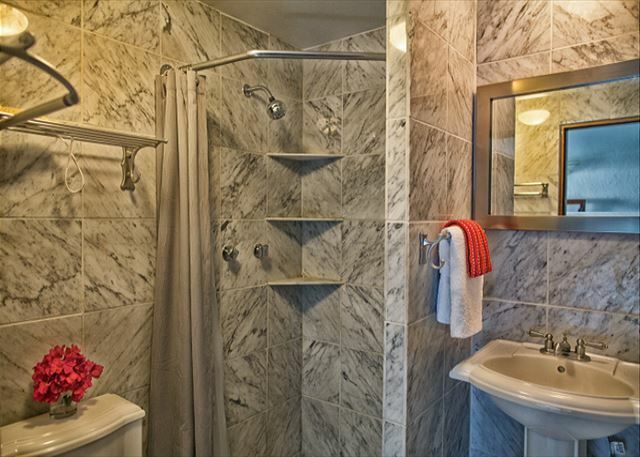 The second guest bathroom is completely remodeled with stand-up shower and vanity. 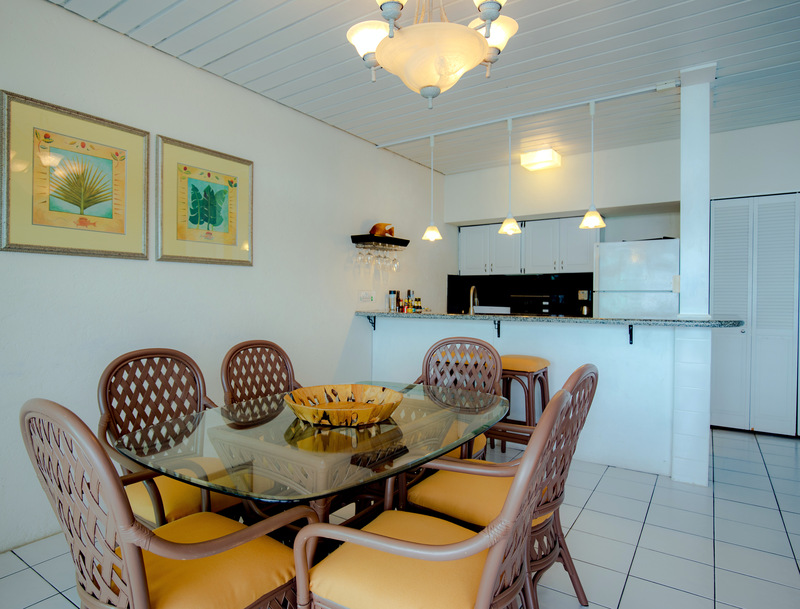 The indoor dining area offers seating for four to enjoy any home-cooked meal with a view. The condo is steps away from parking, resort lobby and activities center, one of three resort pools. Guest laundry service is located steps away from this unit as well. The hilltop pool is located at the hilltop of the resort. Inquire for weekly and monthly rates. This hillside resort on the eastern end of beautiful St. Thomas boasts amazing ocean views and values for your next Caribbean adventure. - TM has been offering memorable experiences to guests for over 40 years and includes 3 pools and is conveniently located to the area’s multiple water and land-based activities and attractions. St. Thomas features many wonderful restaurants within an easy drive or taxi ride. 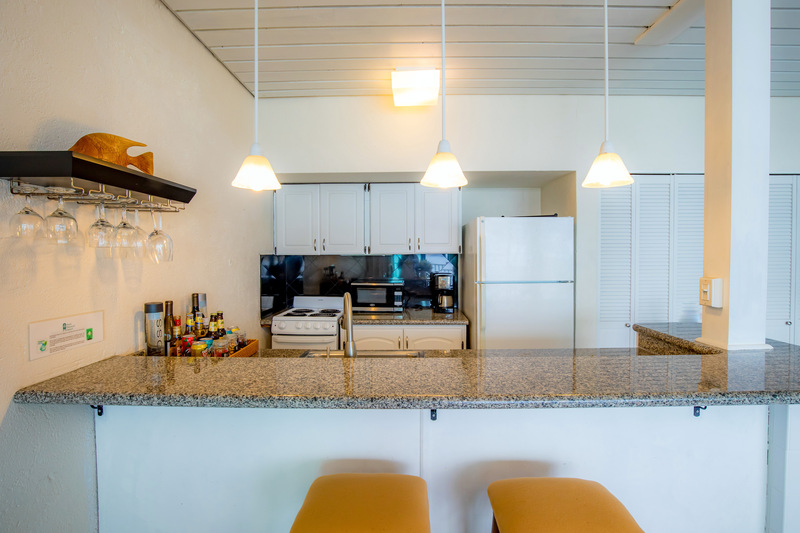 If you prefer al fresco dining on your terrace overlooking more than a dozen Caribbean islands, rest assured the kitchen is well supplied. We know you will appreciate the value of having a kitchen versus staying in a hotel room just like we do. 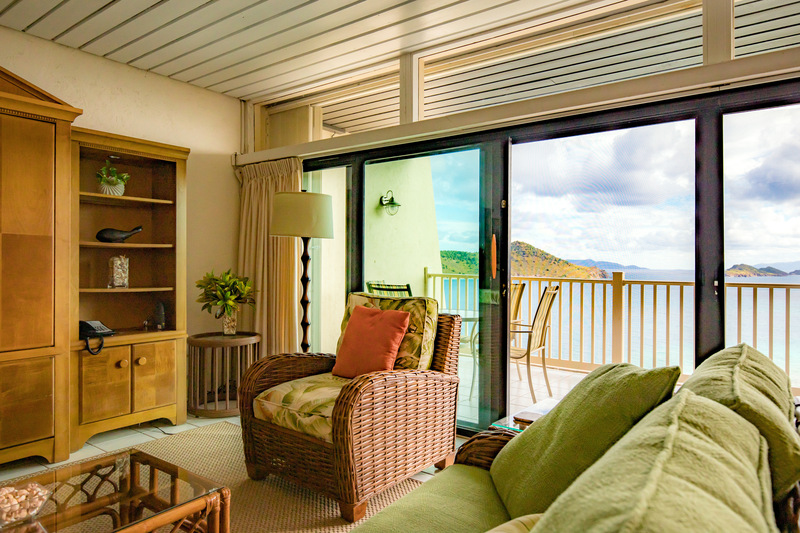 Point Pleasant Resort - TM is located on the east end of St. Thomas just five minutes from Red Hook, home to the ferry boats to neighboring islands and the best nightlife and restaurants on the island. Just one mile away is the number one tourist attraction and best snorkeling beach on St. Thomas: Coral World and Coki Beach. One mile in the other direction is beautiful and peaceful Lindquist Beach. Magens Bay and Little Magens Bay beaches are located just 5 miles away. Traveling to St. Thomas is easy. A U.S. Passport is not required unless venturing over to the British Virgin Islands by ferry. Point Pleasant Resort - TM is located only 8 miles from the Cyril E. King Airport.